Michelle Speakman and her two children live in a two-bedroom apartment in north Portland. The family has lived there for over five years but will soon be forced to move because Michelle’s job as a dental assistant pays just over the amount necessary to receive rent assistance. Without this help, Michelle is left with very few housing options. Gaining her independence has been a lifelong goal of Michelle’s. She wants to give her children a safe and stable home where they can focus on their education rather than worry about where they will move. 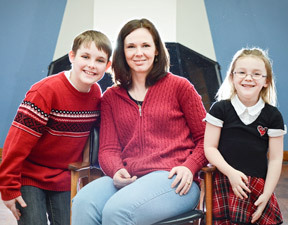 Prior to moving into her apartment, Michelle and her children lived with her sister. Michelle continued to work on her education during this time, so she could eventually earn more and be able to move her family out on their own. When that was possible, they moved into the apartment that they still live in today. While struggling to figure out where her family was going to live after their apartment, Michelle saw a flyer for Habitat posted in the hallway of her building. She talked to a friend who had volunteered with Habitat on site and decided to apply, hoping that affordable homeownership would be the final step to achieving her goal of a stable home. Michelle plans to accrue her sweat equity by building on site, physically working to build both her home and her family’s independence from the ground up. “I am so excited to have the opportunity to build my own home with other Habitat homeowners and volunteers. It gives me the feeling that I am part of a strong community,” Michelle said.